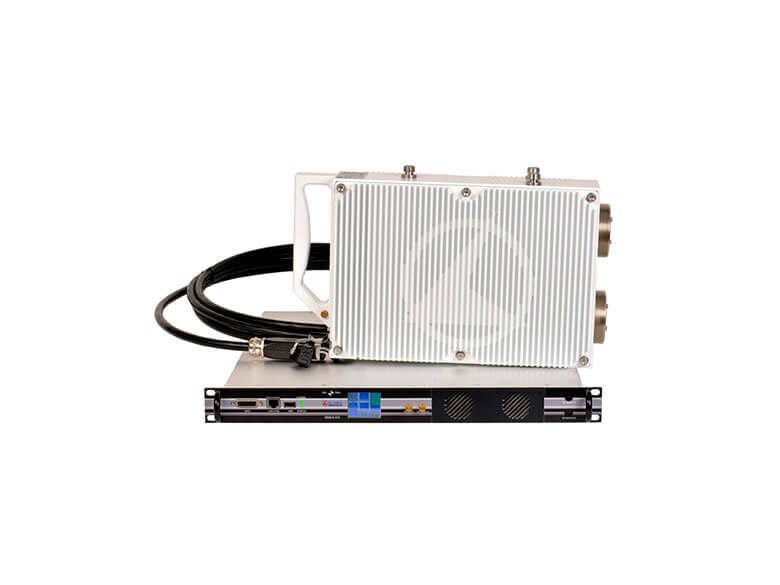 The REBLE610-ODU is the split version of REBLE610 Elber full indoor microwave link, from which it differs for the sep¬aration between the RF part (hosted in a waterproof alu¬minum case) from the modem, the I/O section and control. The indoor unit (or control unit) REBLE610-IDU is equipped with a hot-swappable redundant pow¬er supply, available both with AC and DC inputs. The modular approach has brought to the development of the data interface module (hosting modulator, demodula¬tor and data interface) and the ODU communication mod¬ule (with head supply and optical interface). From an RF point of view, the new transmission circuitry is able to gua¬rantee around 1 Watt with every modulation scheme, in¬troducing, in addition, wideband precorrection (up to 1GHz depending on frequency band). Major innovations on the digital inputs side with three different data interface bo¬ards available: version A is equipped with 10 ports ASI/ BTS on BNC connector, configurable as inputs or outputs, so that it is possible to include the ASI distribution and ASI matrix capabilities in the same equipment; it also provides a GbE port L1 for IP traffic, a 2048 Kbit/s E1 data chan¬nel (as an alternative to 2 ASI/BTS ports), and a "transit" connection (not to waste coaxial connectors); version B is equipped with 5 DVB-ASI/BTS/SMPTE310 ports (in or out) and 5 E1 channels; version C is oriented to TELCO and new generation broadcasting networks, offering both SDH and IP interfaces, with electrical and optical connections, integrating optionally a L2 switch with QoS capabilities. To transfer all these signals the channel capacity has been increased to 56MHz leading to a maximum throughput of 310Mbit/s; using an optional XPIC module (and an extra RELBE610) it is possible to duplicate the bitrate increasing to 610MBit/s, exploiting H and V polarizations and cancel¬ling undesired contenta using special algorithms. Redundant configurations (SD and FD) are supported, as well as HSB adding CLEBER RF switch. A new management software offers complete control over device parameters and settings, an on-board TFT touch-screen allows a simple and intuitive user interface to check for anomalies. The same monitoring and control can be carried out through a particularly easy to use web interface and SNMP. Integrated hitless switch for 1+1 configuration.